Welcome to Honda of Gainesville – your home for stress-free Honda finance. At our dealership in Gainesville, you’ll find an abundance of New Honda Vehicles in addition to an extensive lineup of Used and Certified Pre-Owned Vehicles that are ready for you to lease or finance. Our expert finance professionals are ready to help you make the right choice, whether that’s leasing or buying your next vehicle. Additionally, our website makes the Honda finance process infinitely easier with a number of tools for your convenience. For instance, we have an online Finance Application that can help you get pre-qualified without having to input your social security number. This application has no impact on your credit score or your credit report, so you can feel free to kick the tires to see if you qualify. When you’re ready, you can contact us to Schedule a Test Drive. On our website, you can also use our monthly payment calculator to get a good feel for what you can expect when you get a car loan or car lease at our Honda dealer. We also offer a Trade-In Calculator so that you can get an estimate for your current vehicle in order to calculate the cost of your next move. With all of these tools at your disposal, you’ll be well-positioned to get into a new Honda or a used or Certified Pre-Owned vehicle. Schedule a test drive at Honda of Gainesville today. Drivers in Gainesville, FL can choose between getting a car lease or a car loan for their next vehicle. Getting a car lease provides more flexibility to keep upgrading into a new Honda model every few years, and there are tax benefits due to only paying the amount agreed on your lease terms. However, you are responsible for not exceeding pre-established mileage limits as well as any damage to the vehicle. You might find that an auto loan is preferable for you. Based on your credit history and other factors, our finance professionals will work with you to get the best possible interest rate and annual percentage rates for the loan amount designated on your loan term. With a car loan, you won’t have to worry about any mileage limits. Once you finish paying off the loan amount, you are free to do whatever you please with the vehicle. The monthly payments will typically be higher than a lease, but the added flexibility might be worth it for you. Work with our Honda finance experts to find which option is right for you. Drivers in Jacksonville, Ocala, and Gainesville, FL can visit our Honda dealer today. Our warm and friendly finance staff is ready to assist you with all of your needs. In addition to our stellar online tools, our experts make the car-shopping experience as stress-free as possible. Typically, the finance process is the most unpleasant part of the buying experience, but that’s not true at our Gainesville car dealership’s finance center. We work with the top lenders such as Honda Financial Services and more to get you the best possible loan terms when you finance a vehicle with us. 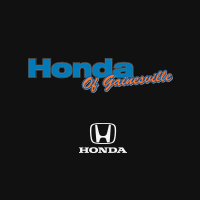 Conveniently located and easy to find, Honda of Gainesville makes getting into a new or used Honda vehicle as hassle-free as possible. Discover this for yourself when you visit us today. Enjoy a better way to buy when you visit our Gainesville car dealership. You can browse our inventory of new Honda vehicles from the ever-popular Honda Accord to the family friendly Honda Odyssey. When you have your heart set on a vehicle, come visit us to seal the deal with auto finance or a car lease today. When you visit us, you also get the opportunity to benefit from the Honda of Gainesville Lifetime Warranty. No matter what type of vehicle you purchase – new or pre-owned – you’ll be able to take advantage of benefits at no additional cost. Coverage includes components ranging from your oil pump to CV joints. When you buy from us, we’re ready to take care of you and your vehicle for the long run. Visit our Honda dealership, Honda of Gainesville, today!